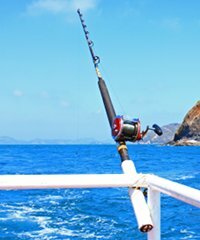 The Wild Bunch Sport Fishing Charters operates out of Kewalo Basin a couple minutes from Waikiki. They operate two boats, Wild Bunch and Wild Bunch too, which are both a 41' Hatteras and this automatically puts them in a league of their own in terms of internationally recognized top-of-the-line fishing vessels. All the best in fishing equipment is available on board including Penn International and Shimano 130's as well as fly fishing gear and tackle. Comfort onboard is covered as well. They boast a comfortable air-conditioned salon with color TV, VHS, stereo and CD system as well as a stove, large cockpit, full refrigerator, microwave, and flush toilet. The Wild Bunch boats can top out at 18 knots and carry well in rough seas. They are capable of traveling in a radius of 25 miles out of port and thus can reach any of the major fishing regions found off the coast of Honolulu in a single day's fishing.